The U.S. Leading Economic Index (LEI) increased 0.4 percent in July to 95.8, following a 0.4 percent decline in June, and a 0.3 percent increase in May, matching the index level in May at the highest level in four years going back to June 2008 (see chart above). Compared to its year earlier level, the July LEI is 1.50% higher, which is lower than the 6% annual gain last July compared to 2010, indicating that the pace of improvement in the LEI has slowed over the last year. MP: Like many other economic variables, indicators and forecasts, the LEI in July predicts ongoing, but moderately sluggish economic growth in 2012, but is not currently pointing to an economic slowdown that would be considered recessionary. As Brian Wesbury's team at First Trust Portfolio has been describing it, we've got a "plow horse economy" that keeps moving forward, slowly but surely. 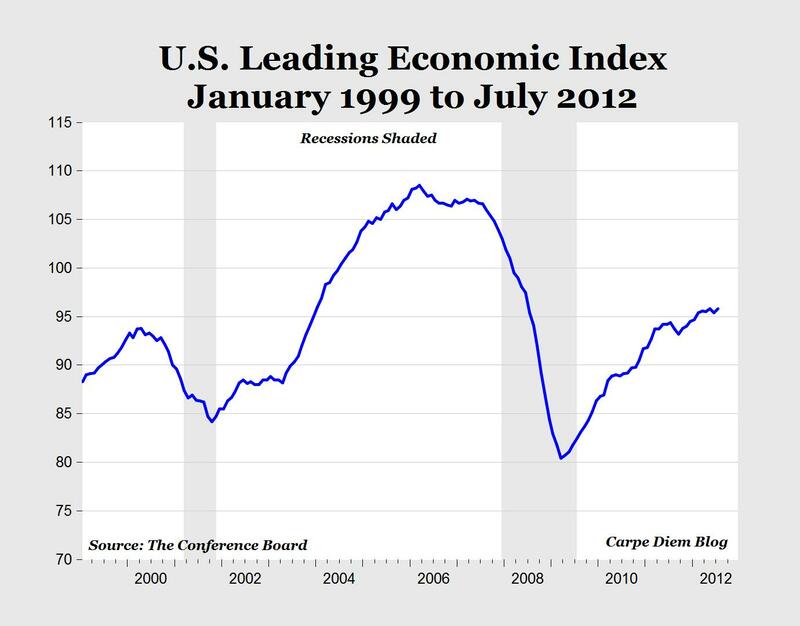 The US Leading Indicator leads the economy by about 12 months (give or take). The relative flatness the indicator has demonstrated over the last few months indicates the earliest a recession could begin is summer 2013.
this index worries me a bit in the time of zirp and qe. the things driving it are largely manipulated rate spreads and the S+P being glutted with printed money. .25 or the .4 increase (which was flat with may) was from those 2.
new orders were very weak as was business expectations (though claims was good). that jump in rates and stocks alone was more just for the month that the whole index is up since feb.
i agree with the "slow" but i'm not so sure we can add steady to that description. this seems like a very fragile situation right now. Fragile is probably a good word to use here. If our economy were a little heather, I doubt Europe would even be a blip on he radar. I agree. Given what the Fed is doing why isn't the index showing more promise? The entire reporting process feels like a trap for the complacent and naive. I imagine that a coordinated intervention could lead to a very nice rebound in the equity markets but it is hard to see how that does not lead to a big problem down the road (after the election) for the much bigger bond market. Why is the Fed of feeble and dithering at a time of dead inflation, and a very limp recovery? Because the bond market is on the edge. Even Bernanke knows that it does not take much to destroy a currency and is quite aware that the BLS statistical manipulation cannot change reality. More on Ticketmaster's Legal "Ticket Scalping"